Below you’ll find the canonical reference for Valentine’s Day email planning. From email examples to specific promotional strategies, we’ve included everything you need to ace your campaign. BarkShop is a consistent winner for its clever content and clear understanding of its devoted pet-parent clientele. We wish we'd written the headline ("choose love ... love chews"), and the hero image made us chuckle. Aside: An NRF survey found that 20% of Valentine's Day gift recipients are pets. Emails like this can only help up that ante. Some people are better with gifts than others. If you think your audience may want to give their partners a nudge, then this example from Le Tote is just what you need. 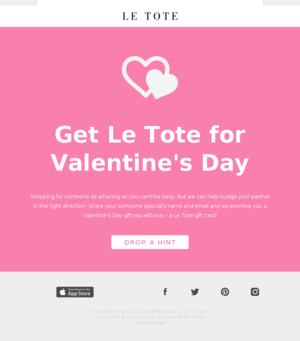 We love the preview text: "Nudge your special someone and we'll let them know you'd love a Le Tote"
We love how this email mashes up two popular retail holidays – Valentine's Day and President's Day. It's a great tactic to use when the two holidays fall within a couple days of each other. 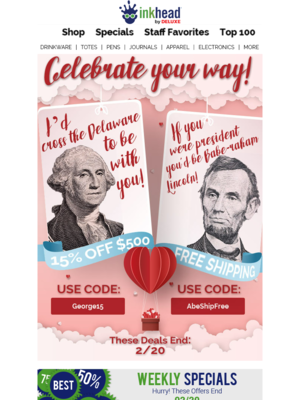 (V-Day always lands on Feb. 14, but President's Day, the third Monday of the month, can be anywhere from Feb. 15 to the 21st.) Kudos, too, for putting the expiration date up front in the email. Emails don't usually make us LOL, but this one did. 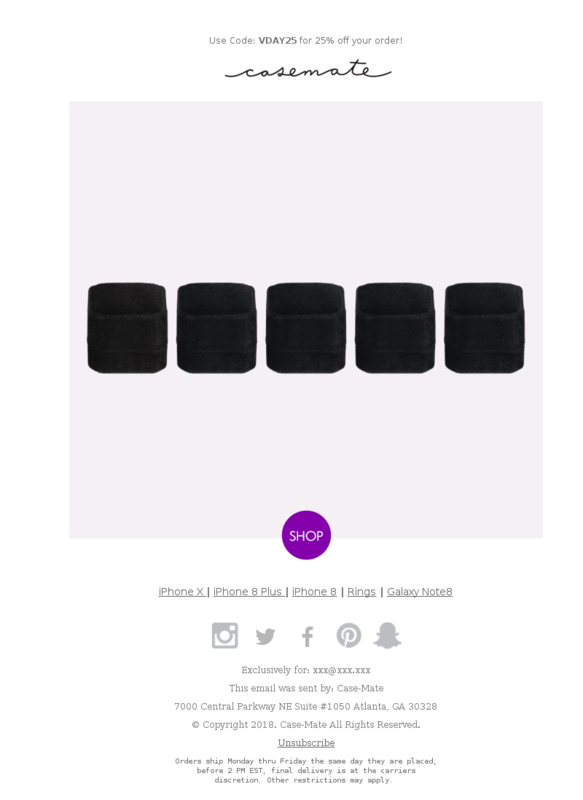 Case-Mate uses a clever animation and subject line ("Put a Ring on it for Valentines Day!") 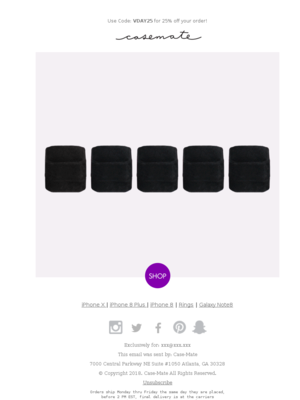 to play on the usual Valentine's Day clichés about rings and ring boxes to promote its cell-phone accessory. Click the image to see it; trust us, you'll be glad you did. It's a great tactic to associate your product with Valentine's Day when it doesn't have natural tie-ins. And, be honest – you have that Beyonce song in your head right now, don't you? 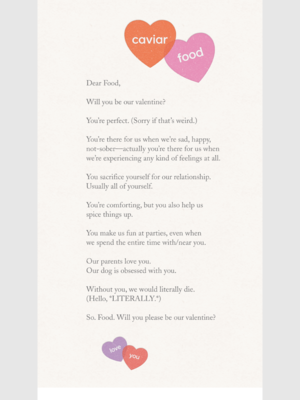 This email by the food-delivery service Caviar is a humorous valentine to food, but the email is actually a vehicle to promote its hyper-local food delivery service. Caviar uses its customer data to suggest local restaurants, which could be places that the recipient has ordered from or which use Caviar to deliver meals. 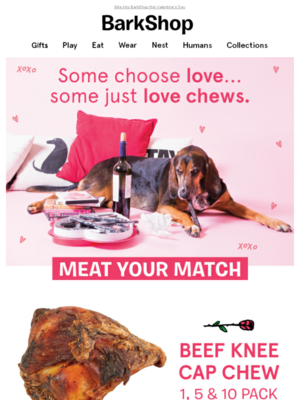 The offer code ("BEMINE") is easy to remember, and the call to action ("Order now") might be just the thing to prompt a click. 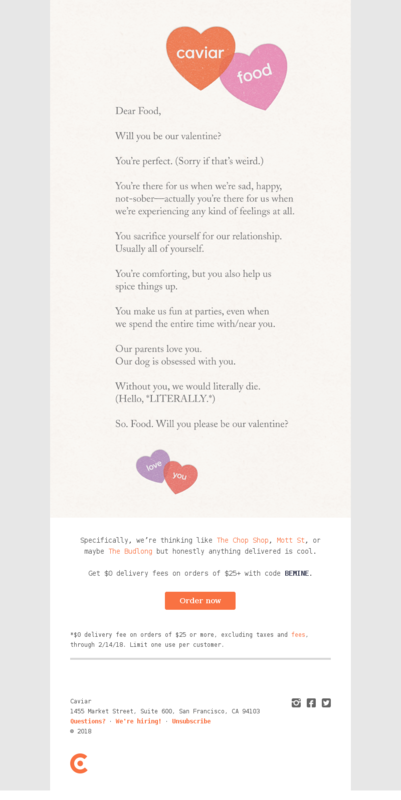 Start planning your Valentine’s Day email strategy with great examples. This Paper Source email calendar is based on Paper Source, who sent 7 emails for Valentine’s Day in 2018. This Jared email calendar is based on Jared, who sent 8 emails for Valentine’s Day in 2018. This The Orchid Boutique email calendar is based on The Orchid Boutique, who sent 1 emails for Valentine’s Day in 2018. Will you simply send one email on Valentine’s Day or will you send a few emails leading up to it, including a “last chance” email once the event is over? Based on 6154 emails mentioning "valentine", "valentine's", "valentines", "cupid" in the subject line. Discover the most popular types of promotions used for Valentine’s Day. Understand how steep a discount companies offer for Valentine’s Day. You can toggle between Dollars Off and Percent Off. Ace your Valentine’s Day email content with these ready-to-implement strategies. Enjoy! Valentine’s Day is the ultimate clash of romance and commercialism, but the traditional emphasis on flowers, candy and jewelry is evolving into experiences over things. Your brand needs to know its customer preferences intimately and be ready to pivot to new directions as needed. Valentine’s Day spending rebounds. The NRF foresees a record V-Day even though fewer people say they’ll celebrate. It predicts consumers will drop a total $20.7 billion, up 6% from 2018. Per-person spending is also expected to set a record at $161. More people want experiences. In 2018, 40% of consumers said they would like an experience gift (dinner out, spa days, event tickets, couples activities and the like) instead of things (jewelry, candy, flowers), but only 25% said they planned to give one. No Valentine? No problem! Although 49% of the U.S. population planned to sit out the holiday, 20% said they would celebrate by treating themselves or getting together with other singles. Valentine’s Day has a relatively short promotion window. Offer a dynamite promotion for early bird bargain-hunters. Also, prompt laggards to act by using deadline-driven promotions, exploding offers, and flash sales. Be very explicit with shipping deadlines. If all else fails, promote your online gift cards. With nearly half of American consumers opting out of Valentine’s Day, that’s a good-size market. Speak to this market with promotions that encourage them to treat themselves. Gift guides help customers find products they might not come across if they were just poking around on your website. A carefully curated product selection promoted via email could help subscribers solve a tricky gifting issue. Some gifts are tricky to buy, like jewelry, electronics or athletic equipment. Devote at least one email to buying tips. Help of this kind motivates customers to succeed even if they’re venturing out of their comfort zone.